Camille Hoffman, Ever Upward, Ever Afloat, 2018. Excelsior erosion control blanket; hurricane tarp; Ninja Turtles kickboard; Dollar Tree scenic landscape and golf course calendars; camouflage party napkins; tiki party decorations; Destiny inspirational poster; Lysol Clean & Fresh package; Jonah & the Whale Watchtower brochure; Planet Earth beach ball; Hudson River freight ship print-out; Thanksgiving, Tropical Paradise, Frozen, Moana, Super Bowl Sunday, Dora the Explorer, Jake the Pirate, and Finding Nemo plastic holiday tablecloths; dolphin high-pile blanket, Pioneer Supermarket, Western Beef Supermarket, Home Depot, We Care We Recycle, Thank You Thank You bodega bags, Chinatown/Ghana Must Go plastic bags; aquarium liner; stretcher bars; oil and acrylic paint on plaster, wire and wood. Camille Hoffman’s Ever Upward, Ever Afloat is presented on the occasion of Queens International 2018: Volumes. 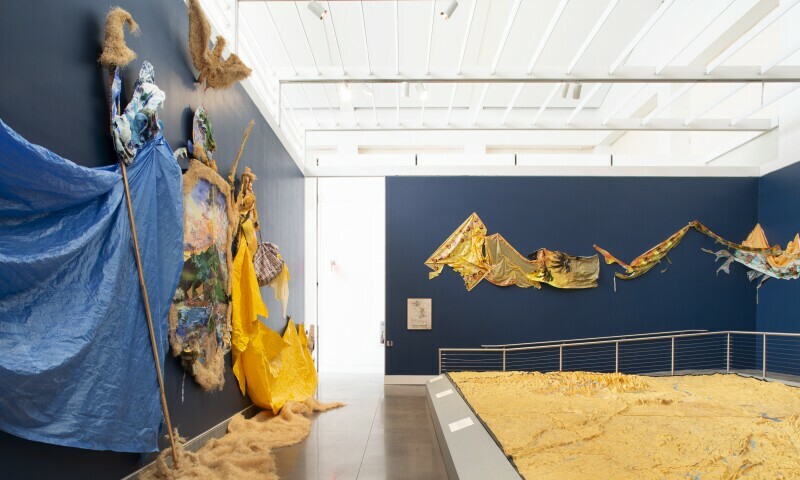 The mixed-media collage and painting installation remains on view as part of Queens Museum’s series of contemporary works mounted in relation to the Relief Map of New York City’s Water System. A Works Progress Administration project commissioned for the 1939-40 World’s Fair, the Relief Map remains a symbol of the Fair’s optimistic focus on the future with the promise of new technology, infrastructure, and innovation. An incredible engineering feat at the time, the massive system of aqueducts it depicts still brings fresh water from the Catskills to the ever-growing metropolis of New York City; however its mechanisms remain largely unregistered in our daily consciousness. Hoffman’s immersive gallery-sized landscape surrounds the relief model, and references New York’s official state motto, “Excelsior,” a Latin term meaning “ever upward”. She also prominently features a wood fiber material known as “excelsior” throughout the installation. Commonly used to prevent erosion, in Hoffman’s application it is juxtaposed with synthetic, mass-produced items such as plastic tablecloths and calendars that are printed with idealized depictions of nature. From these materials, she renders a subversive iteration of the New York State seal replacing European symbols in the center crest with references to her own Filipino heritage, indigenous sovereignty and land stewardship, foregrounded by a portrait of her Ramapough Lenape friend, Two Clouds. In a process of altering and reclaiming through collage and paint, Hoffman encourages a reflection on the discrepancies between the motto–connoting unfaltering progress–and the impact of the development of advanced manmade systems on the environment.